Baldas parent company, Ferrino, is internationally recognized as a leader in outdoor mountaineering equipment and suppliers to The United Nations and the Italian National Alpine Rescue Squad. Italian Made and tested in the Italian Alps under severe winter conditions. This is an excellent all 'round snowshoe for sport hiking, back-country trekking, recreational use and scenic tours through the winter landscape. Produced using a mixed ceramic / composite material, MIAGE snowshoe blends amazing lightness (350 gr.) with great strength. MIAGE floats on snow powder thanks to its large supporting surface, and climbs easily in any condition with a rapid-action heel lifter that reduces calf muscle fatigue. 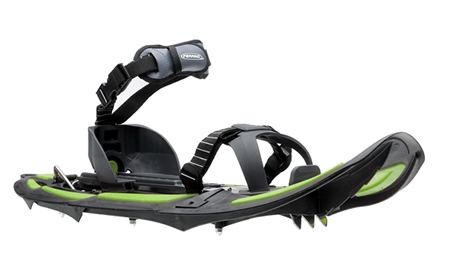 MIAGE snowshoe features an integrated anti-overturn system that allows for natural foot articulation and good sidehill traction. 6 special steel crampons with sharp-end points for extra gripping and a more natural stride. Castor Bindings have an easy-to-adjust baseplate to fit any sized boot. The harness is quieter on the snow than other brands and this appeals to nature lovers who don't want to frighten wildlife. The snowshoes come in a bright safety orange, non-trip carry bag with extra loops to attach walking poles plus a special pouch for a water bottle.